“Not enough available storage” is always a bad experience to most iPhone iOS 10/11 users who have come to the critical storage point where there is no space left on their device, and this notification portrays the inefficiency of iPhone storage space to contain as much files as users would love to keep on their device. Moreover, "How to free up memory space on iPhone" is becoming one of the most asked questions on search engines. Nonetheless, quite a number of software have been engineered to tackle iPhone storage space problems. Some prominent apps that are widely perceived as solutions to "not enough available space". 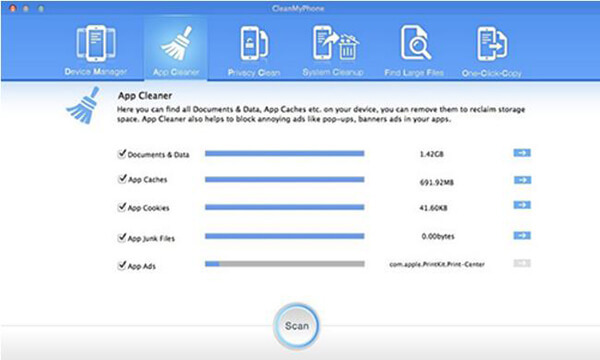 CleanMyPhone is an iPhone iOS 11 application that can be used to scan and cleanup unneeded files, useless files on iPhone, iPod or iPad to reclaim storage space and make your device run smoothly. It is also useful in storage space analysis, organizing, managing and configuring apps on iDevices. It backs-up needed files such as photo-library, music, contacts, notes, camera-roll, reminder, etc. to your PC. You can be able to view the previous backups. It serves as a cleaning tool for removing junk files, unnecessary and useless files. It can be used to find and clean large files on your iOS 10/11 iDevice. It is not specifically meant for iOS devices; therefore, the features are not as in-depth as needed. It seems to be more compatible with Windows OS than macOS. 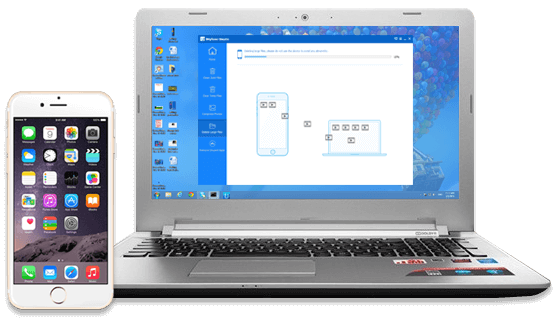 As a better alternative to CleanMyPhone, iMyFone Umate Pro or iMyFone Umate Pro for Mac can be said to be a more superior app than CleanMyPhone; it has all the features that CleanMyPhone can boast of and many more. It supports clean junk files, delete temporary files, compress and backup photos, delete and backup large files, and remove unused apps. With over 25 analysis technology, you can finish all of work just by one click. Compatibility with iDevices: As we mentioned earlier, CleanMyPhone is not specifically meant for cleaning and optimizing iDevices. Therefore, it is not an efficient tool in-depth iPhone cleaning. On the other hand, iMyFone Umate employs more than 25 analysis technology that are highly compatible with iOS to help clean up your iPhone. Security and privacy: iMyFone Umate will backup your photos and large videos, ensure that your meaningful files are 100% protected. Affordability: iMyFone Umate is highly affordable. It also offers discount of $5 to customers who will share the page on the social media page. On the other hand, CleanMyPhone is sold at the price of $39.95 with no promotional discount of any kind. We have seen the clear differences from the comparison between CleanMyPhone and iMyFone Umate. We now understand the need to use cleaning software that offers you the best experience. 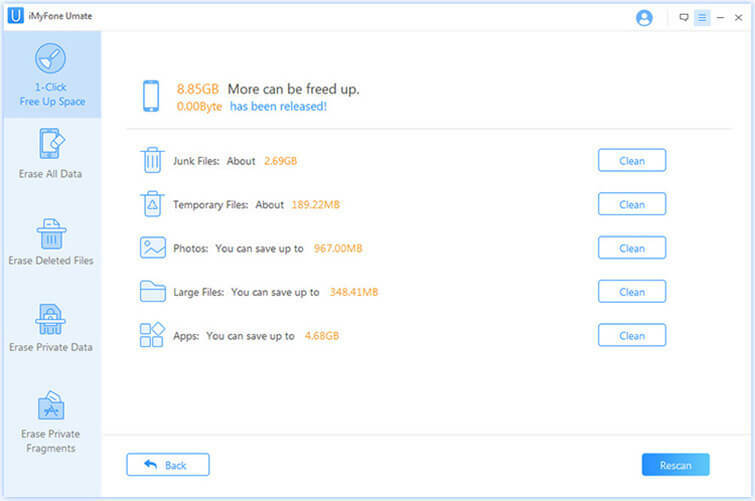 Hence, we would like to give you a step-by-step guide on how to utilize iMyFone Umate to free up iPhone storage space. 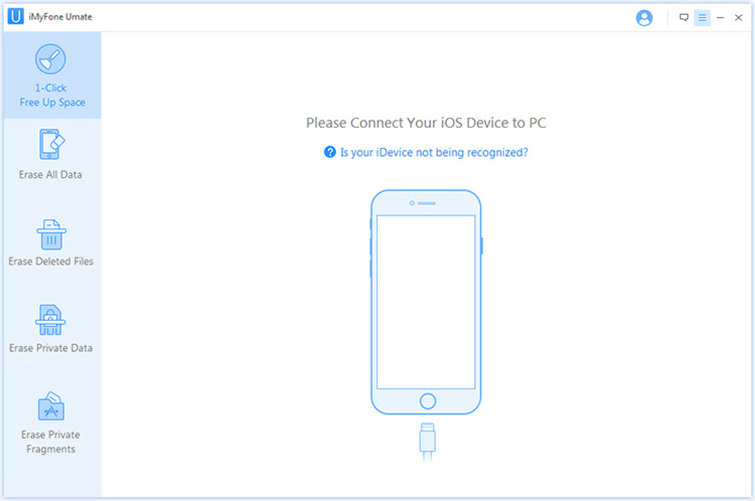 Step 1: Connect your iOS 11 device to your laptop after downloading and installing the software on your computer. 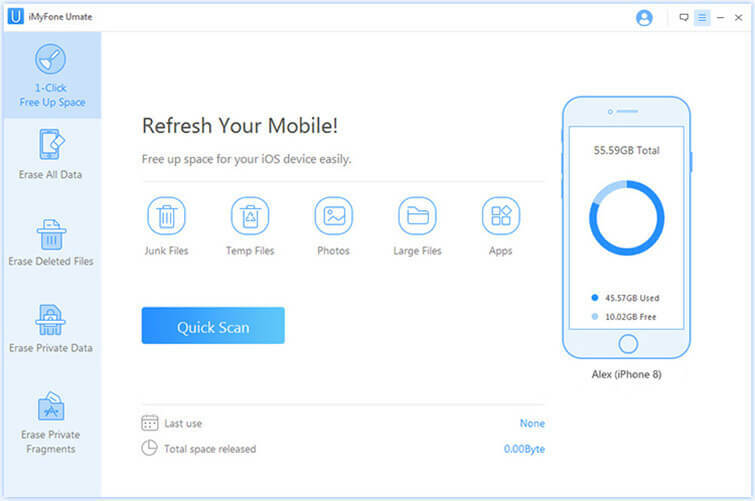 Step 2: Scan your iOS 11 device to detect large files, needless files, useless files, browser caches, cookies, temp files, app logs, and other files, which you can either choose to backup and delete selectively or in batch. Step 3: Click "Clean" to free up space. iMyFone Umate offers a fast one click option through which you can release massive space.